After a match that was an absolute credit to the 50-over cricket and had offered superb entertainment for nearly 5000 supporters at North Marine Road, Yorkshire Vikings beat Notts Outlaws by two wickets with two balls to spare. The match was a particular triumph for Tim Bresnan, who followed his two important wickets with the new ball by making a match-winning 95 not out to steer his side home after the tensest of run-chases. The result also greatly strengthens Yorkshire’s chances of making the quarter-finals of the Royal London One-Day Cup and Alex Lees’s men may believe that if they can keep their nerve in this fashion anything is possible. However, the result at Scarborough was hard, indeed, on Steven Mullaney, who had made 89 not out in the Outlaws 251 for nine and on Dan Christian, who had followed his half-century with three prime wickets. 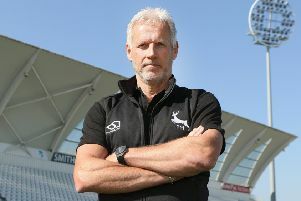 Requiring 252 to win, the Vikings had initially got off to a good start with Adam Lyth hitting five fours and two sixes in a 26-ball 39 before driving Harry Gurney straight to Luke Fletcher at mid on. But that began a seven-ball sequence in which Yorkshire lost three wickets, Travis Head pulling Gurney to Luke Fletcher and Jack Leaning being caught behind by Read off Jake Ball. Both those batsmen fell for nought and when Alex Lees was also caught by Read off Ball, the catch being palmed up and then kicked to the keeper by Mullaney at second slip, Yorkshire were 50 for four in the ninth over. However, from that low point - Rashid was dropped on nought by second slip Mullaney off Ball – Yorkshire’s fortunes improved as Tim Bresnan and Adil Rashid put on 97 in 22 overs for the fifth wicket before Rashid was caught at long leg by Fletcher off Dan Christian for 41. Useful but nothing like match-winning stands followed with David Willey, Plunkett and Andy Hodd but it was Azeem Rafiq who gave Bresnan most help. making 17 not out and cover-driving the winning runs off Fletcher. Earlier in the day, after Alex Lees won the toss and opted to field, the Vikings made an early breakthrough when Michael Lumb miscued a drive off Tim Bresnan and was caught by Alex Lees at mid-on for nine. But that was only the prelude to a clatter of wickets as the Outlaws slumped to 46 for five after 14 overs, Bresnan taking another wicket and two others falling to Liam Plunkett, who bowled a very sharp spell from the Trafalgar Square End. Greg Smith was one of three Notts Outlaws batsmen dismissed for nought when he pulled David Willey to Travis Head, who was fielding on the boundary just in front of square leg and it seemed at one stage that the visitors were going to post a clearly inadequate total. However, a recovery was mounted, first by Dan Christian and Steven Mullaney, who added 85 in less than 17 overs as the wicket eased as the batsmen’s shot selection improved. Christian made 52 off 65 balls but was prevented from inflicting further damage on the Outlaws when Lees pouched a brilliant catch at backward point off the full-blooded cut which the Notts all-rounder played to a ball from Patterson. That wicket fell on 131 but Chris Read and Luke Fletcher then kept Mullaney company during brief partnerships which raised the score to 183. Read was caught by Hodd off Willey for 15 and Fletcher was stumped by Hodd for 13 but the next major resistance was provided by Jake Ball, who whacked two sixes and two fours in a 16-ball 27 before he was bowled by Patterson to end a ninth-wicket stand of 42 in less than five overs. Mullaney, though, launched a late assault on Patterson and Willey taking 34 runs off the last 14 balls he faced to hoist the Outlaws total to 245 for nine off their 50 overs, far more than they may have anticipated making after an hour’s play. Bresnan, Patterson, Plunkett and Willey all took two wickets but Rafiq’s single success cost him 49 runs, partly because he was bowling to Christian in full spate.